The Scots impressed with some massive hitting against the Brits. 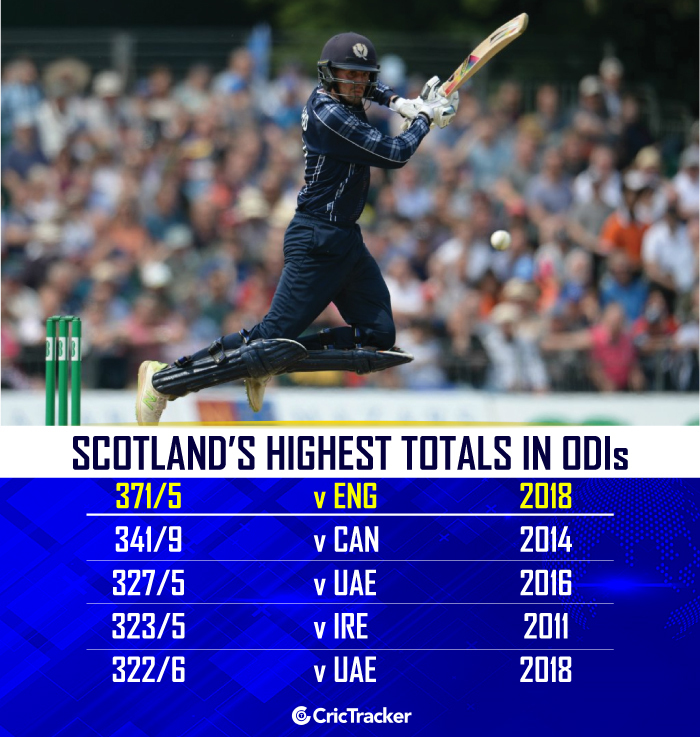 When Scotland took on England in the one-off ODI in Edinburgh, little did anyone expect what was to come? In the overall context, England is the number one ODI side in the world, something that many have expected following their recent exploits. The new bowlers have also impressed quite a bit with Mark Wood and Tom Curran also proving to be amazing with the ball. However, in Edinburgh, it was a clear case of a David vs Goliath scenario. This was meant to be an appetizer prior to the start of the series against Pakistan. However, what Eoin Morgan and his band of merry men witnessed was a spectacle from the bat of Calum MacLeod. The latter remained unbeaten on his score of 140, something he had slammed from just the 90 odd deliveries he had faced. Something that a full-strength England side would have certainly not expected was the sheer fact that the Scots got off to somewhat of a flier. Matthew Cross and skipper Kyle Coetzer began slamming the ball to different parts and brought up the hundred-run stand in no time. However, in spite of the fact that they lost wicket, it was quite clear that the show would indeed go on. MacLeod began is trouncing of the England bowlers and was promptly joined in by Berrington and Munsey, players who have a reputation of clearing the fence on more than one occasion. However, it was Calum MacLeod who stole the show as he had no problems finding the fence on several occasions. He ended up with 140 to his name, something that sees his name up in lights. As far as Scotland goes, it is one of the few occasions that they have crossed the 300-run mark against a full ICC member. They had done so against Ireland earlier as well.